St.Paddy’s Day is just around the bend, and no matter your heritage, you can be Irish for a day. If nothing else, it’s a great excuse to capture the Gaelic spirit with drink and celebratory food. Corned beef and cabbage is the first dish that comes to mind – Lord knows I’ve blogged that recipe to death – and this year I want a change. After a bit of investigation, I’ve concluded that an Irish Lamb Stew is, perhaps, more representative of traditional Irish food then the other famous duo I’ve been concocting for years. After all, according to wikipedia, tradition has it that St. Patrick, after being brought over to Ireland and enslaved, found God while he was herding sheep. After a day of rugged shepherding, the patron saint of Ireland might have appreciated a bowl of rich and savory stew. Season w/ kosher salt and pepper than dredge in flour. Cook lamb until golden brown on all sides. Deglaze pan with a splash of beer. Add stout and stock then simmer. A bouquet garni or thyme & rosemary. Stir in barley for a classic Irish touch. Today Ireland is undergoing a culinary renaissance, and the farm to table movement is sweeping the bonny, bucolic landscape. But it wasn’t always so. Times have changed on the Emerald Isle, and itineraries to Ireland can be built around sampling the food. Indeed, my husband Richard and I are planning to explore Ireland’s culinary landscape in early summer. You are what you eat, eats: Pasture grasses at Lamb Farm. But we’ve our own fields of clover close to Ann Arbor. Lamb Farm is nestled on 250 acres in Manchester by the Raisin River, and the rolling acreage is well-suited for pasture-raised lambs. 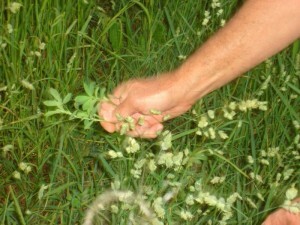 The lamb has a rich complex flavor, which is a direct result from the farmer – John Smucker’s – attention to the cultivation of diverse flora in his fields, maximized by the use of organic growing techniques. “Being able to call ourselves ‘sustainable’ is more important than our certified organic designation,” he continued. “Sustainable agriculture for us means not pushing the limit. It all begins with the soil. To have healthy animals you must have healthy soil for quality grass to grow.” One could surmise you are what you eat, eats. 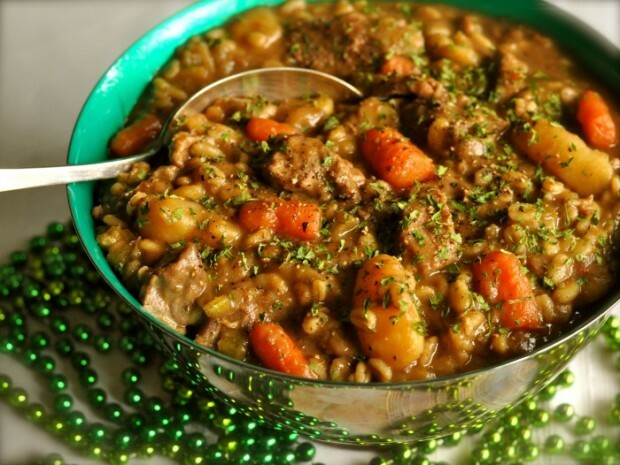 For this recipe, I purchased Lamb Farm lamb from Arbor Farms, as well as a Michael Faricy’s Stout, brewed by Arbor Brewing Company – a nice local take on a traditional Irish stout. The brew’s bittersweet chocolate flavor, with the slight smoky finish, was the perfect complement to the stew. If you’d like to try lamb from Lamb Farms, you’d best shake your tail; the season will be over shortly after Easter. Arbor Farm’s Robert Cantelon tells me after that they switch to whatever Michigan lamb they can find, but not off of a certified organic farm, like Lamb Farm. A toast to yours and The Luck of the Irish! Season lamb with kosher salt and freshly ground pepper and coat all sides with flour, shaking off excess. In a heavy-bottomed pan or Dutch oven, heat oil to medium high. Sear lamb, in batches, so the lamb browns in a single layer, and it is golden brown on all sides. Remove and reserve. Deglaze pan with a slosh of beer, whisking bottom and sides of pan to remove accumulated brown bits. Reduce heat to medium and stir in carrots, onion and celery. Simmer until just tender, adding a tablespoon of beer, when needed, to keep the vegetables from sticking to the bottom of the pan. Return lamb to pot and stir in potatoes and garlic; stir in beer and 4 cups stock. Tie rosemary and thyme into a bundle and place in liquid. Simmer 1-2 hours on medium-low heat, occasionally stirring, or until potatoes can be pricked with a fork, but are not falling apart. Stir in additional stock as needed to thicken the stew to desired consistency. Stir in barley, if using, and continue cooking until barley is tender, about 20 additional minutes. Remove twine and herb stems from stew. Serve sprinkled with chopped parsley, if using. *A bit of fat attached lends tenderness and flavor. More Recipes Filed Under "Lamb"